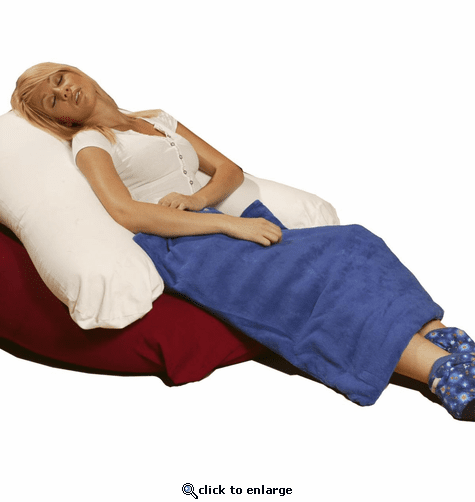 Nature Creation\xCDs Body & Bed Warmer is an effective natural pain relief solution. Designed to cover the lower torso and legs the Body & Bed Warmer may be used as a hot pack or as a cold pack to relieve muscle aches and reduce stiffness. It can also be used as an alternative to electric blanket to relieve back pain and promote muscle relaxation. For people who don\xCDt like to get into a cold bed, the Body & Bed Warmer is a great way to heat your bed quickly and without any risks. It is also a great solution to keep you warm in winter days while watching TV or sitting in front of the computer instead of heating the entire home. The Body & Bed Warmer hot pack is filled with our blend of 100% natural herbs, which provides uplifting and soothing aroma in addition to the benefits of a regular hot and cold pack. The aroma can help relieve tension and stress and promote overall relaxation. It\xCDs not only an effective body & bed warmer blanket but is also pain relief solution. It is an easy to use DIY relaxation therapy. It is prepared using 100% natural herbs to provide the patients with combined benefits of a regular Hot and Cold wrap and Aromatherapy treatment. It has soothing aroma that relives you tension and stress and promotes you relaxation and overall wellness. Material/ Fabric: 100% Cotton and Fleece. This revolutionary solution can be applied on a large area of upper body, lower body, lower abdomen, legs and feet. Use the pack immediately to warm your body after heating it. It relieves muscle aches, menstrual cramps and also reduces stiffness. Use it cold to relive muscle pain, reduce fever and swelling. Being a versatile product, it can be used both hot and cold and even as regular blanket. While using this product in the winter, simply heat the product and cover your body by it. In summer days, store the pack in freeze and use and use it as cool to refresh your body. 1) Protect the Body & Bed Warmer heat pad from dirt and daily wear and tear. 1) Maintain heat longer and maintain the natural moisture that develops during heating time. 1) Cleaning is easy: the protective cover is machine washable. Apply Body & Bed Warmer heat pad on desired area for relief. Do not apply directly on skin. Repeat as necessary, 10-30 minutes application recommended. Use caution when applying on sensitive parts of the body. When using on children adult supervision is advised. To Use as Hot Pack: Prior to heating, remove all paper, staples and plastic packaging. Heat on high in Microwave for 2 _ minutes. If pack is not warm enough, add 30 seconds heating time. If microwave does not have a turntable, turn over the pack halfway through heating process to even out temperature on the entire pack and avoid hot spots. To reuse after application, reheat for 1 _ minutes. Do not overheat product. Storage: When not in use keep the pack inside a plastic sealable bag and put in the freezer. Prior to first storage, heat the pack in the microwave on high for 1 minute and then store inside the freezer as instructed. Cleaning: Remove the fleece cover from the pack. the fleece cover is machine washable. please follow the laundry instructions on the fleece cover lable.